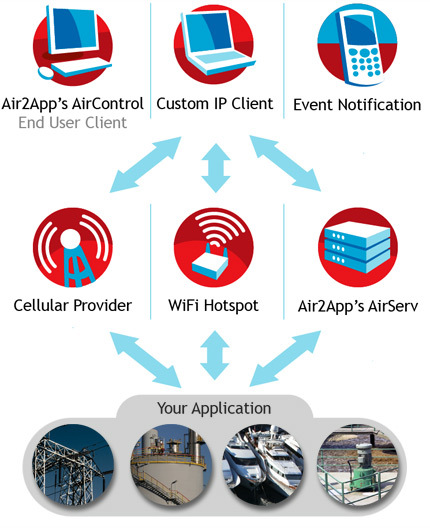 Air2App provides End-to-End Wireless Telemetry Services to OEMs as a Value Added addition to existing products or as a way to deploy new applications not possible before. The field application with an integrated wireless connection. The end user with Internet access. Air2App currently makes use of cellular, WiFi, and Ethernet to connect to a remote AirBase. Our current cellular networks are CDMA 1x and GSM GPRS. WiFi includes commercial hotspots and municipal systems.